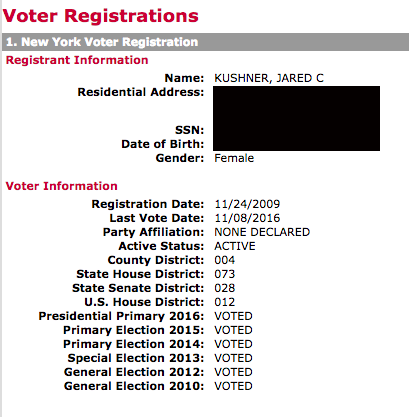 Jared Kushner, senior adviser and son-in-law to President Donald Trump, apparently registered to vote as a female, according to his publicly accessible 2009 New York state voter information. The records held by the New York State Board of Elections show Jared Corey Kushner is registered to vote as a female, Wired first reported. The White House declined to comment on the story. Kushner, who is married to Trump’s daughter Ivanka Trump, has been under fire lately for occasionally using a private email account for correspondence with fellow administration officials, his lawyer, Abbe Lowell, confirmed to CNN on Sunday. In January, Trump said 3 to 5 million people voted illegally — about the same margin Hillary Clinton won the national popular vote by. In February, he said thousands of people had been bused to New Hampshire from Massachusetts to vote illegally in the swing state. None of those claims have been proven. But earlier this month, Trump’s “Election Integrity” commission met in New Hampshire to look for evidence.